Your Christmas party has begun and Santa has not yet arrived. Who can entertain the children and the adults in Santa's absence? Mikey the Juggling Elf, that's who! Mikey brings the talent and charm of professional juggler Mike Battie to your festive event. 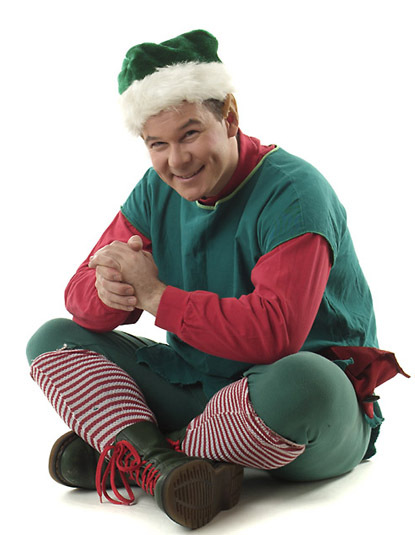 For twenty years, Mikey the Juggling Elf has been warming hearts young and old with his dynamic thirty-minute stage show. He can enhance your gathering as a strolling entertainer on his unicycle, or impart his skill of juggling in the ever-popular juggling workshop. Mikey the Juggling Elf has entertained at corporate events, business parties, hotels, winter festivals, fundraisers, house parties and malls. The addition of this loveable character makes a good party a great party! Based in Vancouver, Canada. Copyright 2008 Mike Battie. Photographs by Hamid Attie. Send comments to webmaster@mikebattie.com.